I whipped up this baby quilt a while ago using 2 Bliss charm packs. 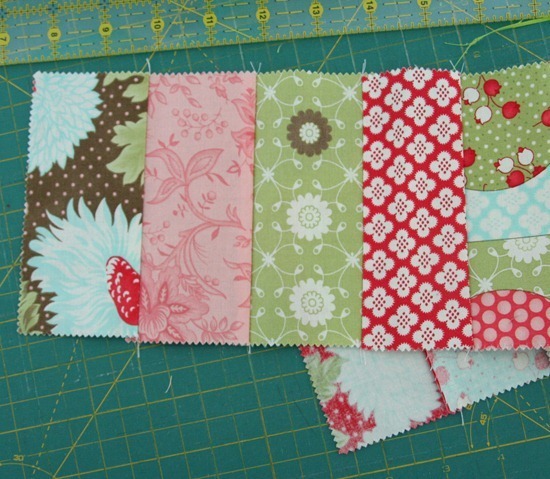 If you want to make a quilt like this start with 2 Charm packs. There should be 80 squares and you only need 72…so pick out 8 squares to make the flower (or not). You can see I picked out 2 of the red squares (4 petals from 1 square), 1 green for the leaves, 1 blue for the center and 4 more to make eight. Then cut all of your remaining charm squares in half. You should have 160 strips 2 1/2″ x 5″. I mixed up all the strips and sewed them back into pairs. Then I sewed those pairs together into sets of 4, and then I sewed my sets of 4 together into sets of 8. If you do it that way vs. laying out all the little strips it will go faster…plus you can chain piece everything. After I had sets of 8 I laid them all out into rows….two set per row. Then you can finish sewing together your quilt top. 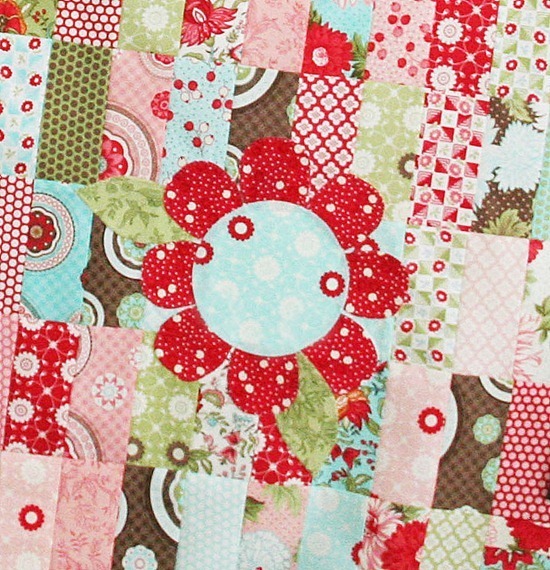 Your on your own with the flower…I basically just fused the charm squares to webbing and cut out my shapes. For the petals…you can fold your charm squares into fourths and draw the petal shape on the paper backing of the webbing and cut them out. Very nice! I wish I knew of someone who is having a baby. so simple. I love it. Okay, I JUST bought TWO charm packs of Bliss the other day…and then you post this. How ESP is that? I was just going to make a simple block quilt with white panels in between each block, but this is wonderful too. If I don't use my Bliss, I'm definately going to use this idea with another charm pack. I really love it! I like these simple kinds of quilts – go together quickly and if you add a little bit of applique it really does something for it. Darling. I simply adore this fabric line. I have already used it once in a quilt…and also in small projects. This is so cute. Love the flower on it. What a fun and fast quilt top! I just got two charm packs of Origins for a steal but didn't have a project in mind for them. This might be it! Love the flower! The applique really lifts this already pretty quilt. Lovely. Great quilt! I LOVE it! Very cute. Do you use pinking shears for all your quilt cutting or did the fabric just come like that? Also do you recommend bias or straight edge binding for quilts? such a pretty quilt – I love your creations ~ I received a 'petit-four' – minicharm pack of Bliss from Camille when I ordered some of her patterns last year and used them to make a small wall-hanging – love this fabric! I don't think anyone can get enough Bliss can they?! 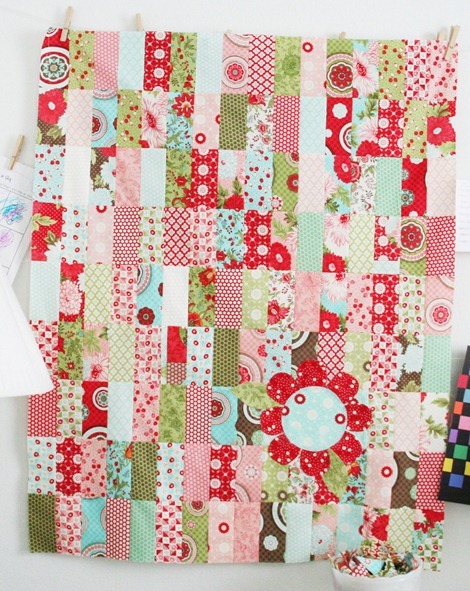 such a cute quilt, will have to add that to my want to do list! This is a really cute quilt. I might make a version out of my It's a Hoot charm packs. I have two Bliss charm packs in my stash!!!!! Very cute! The flower is a perfect touch! This is adorable…the fabric just makes it! Thanks for sharing. Aw, that is such a sweet quilt! Way to whip it up. that is a super cute bliss quilt! although it's making me wish i would have bought more than one charm pack. Such sparkly fabrics! The flower just makes the quilt. This is so neat! You are super nice to give me ideas for my many, many charm packs. I look forward to your blog the most and miss them when you are gone. Thank you so much. This is a wonderful quilt! I was in one of my favorite little fabric shops today, Pine Needles, and guess what? Sooo cute! I just love it! I have been looking for the bliss charm packs and cannot find anywhere that has them. Does any one know where to find them? To make 160 strips don't you need 80 squares? I'm just making this with hunky dory which has 42 squares per pack so I have 4 for the flower but had to use all the remaining 80 squares for the 160 strips! It's so cute – love the simplicity of the design,thanks for sharing! Oh this is so beautiful. I am going to make this in some blue vintage prints I picked up from an Etsy fabric store http://fabrictreasury.etsy.com . She had lovely vintage fabrics. That was absotutely beautiful!! Wow! I liked the flower in red. It's a bit difficult to see the leaves in the picture.